Special Representative and head of the UN Assistance Mission in Afghanistan (UNAMA) Nicholas Haysom. The new Afghan Government, formed through a power-sharing agreement, must manage its difficult transition in 2016 by overcoming political, economic and security challenges, the top United Nations official in that country told the Security Council today, as the 15-nation body extended the UN mission there for another year. “In 2016, Afghanistan is being as severely tested as it was in 2015, by the task of managing its difficult transition with its interrelated political, economic and security challenges,” said Nicholas Haysom, the Secretary-General's Special Representative and head of the UN Assistance Mission in Afghanistan (UNAMA). He highlighted five major hurdles facing the National Unity Government, including a contracting economy, an intensifying insurgency, an increasingly divided political environment, significant medium-term financial demand, and the need to achieve progress towards a sustainable peace. “For 2016, survival will be an achievement” for the Government, he said. “Some may criticize this benchmark as being low, but survival does not mean inaction, or merely 'treading water,' but it means active engagement in confronting the five challenges," he added. On the economic front, there had been an assumption in 2012 that the economy will continue eight per cent annual growth and the exploitation of Afghanistan's abundant mineral resources would drive economic development. “It is now clear however that neither would occur,” Mr. Haysom said. The World Bank now expects low economic growth, off a low base, which in turn has resulted in high unemployment, with hundreds of thousands of young people entering the work force each year finding no jobs. Turning to the security situation, the Taliban, emboldened by its military successes in Kunduz and elsewhere, will continue to test the Afghan security forces across the country, he noted. Yet in this first year of independent command, the Afghan security forces have largely held their own in the face of continuing high rates of attrition, he added. “The stakes are high, not least because the loss of a provincial capital, even if temporarily, would have significant repercussions for the National Unity Government's political standing,” he said. On a positive note, since his previous briefing, the presence of Islamic State in Iraq and the Levant (ISIL/Da'esh) has been confined to a smaller area to the east of the country, following operations by Afghan security forces with support from the international military. On the political transition, the Government continues to be subject to criticism on account of the economic and security deterioration even though this is not of its own making. It is being challenged by fractious political elite, the erosion of a necessary sense of national unity, and consequentially that most precious political commodity, confidence in the future, he said. In the face of calls for reviewing the current political framework, the United Nations and the international community have made it clear to all stakeholders that it stands firmly behind the new Government. Despite delays in effective decision-making, the Government has now appointed an Attorney General and a Minister of Interior. A number of key posts, however, remain to be filled. With an election date of 15 October announced, electoral reform is important for the National Unity Government to indicate progress in democratisation. The Government has finally issued a decree establishing a new Selection Committee to nominate Independent Election Commissioners this week. Yet the urgency to complete preparations remains. In the coming months, the international community will make critical decisions at Warsaw and Brussels on the level and type of assistance it will continue to provide to Afghanistan, Mr. Haysom said. As the country continues to rely on external funding sources for 69 per cent of Government expenditures, failure by the international community to pledge a medium-term commitment to Afghanistan will have a devastating impact, both materially and on the levels of confidence of ordinary Afghans. Donor expectations of Afghanistan's reform agenda must be realistic, taking into account the formidable challenges facing the country. The final hurdle is progress towards a sustainable peace. “Afghan's want peace, they deserve peace, but most importantly they need peace,” he said. Without a peace process, the sustainability and viability of all of efforts, in Brussels, Warsaw, New York, and elsewhere to bring stability and prosperity to Afghanistan will be called into question. The establishment of the Quadrilateral Coordination Group is a welcome development that has reinvigorated efforts to put a peace process on track, he said, acknowledging the efforts of Pakistan to assist in midwifing such talks. A successful peace process will require the support of neighbouring countries and the wider region. He, however, called for direct talks between the Taliban and the Afghan Government, noting that he again met with the Taliban Political Commission last week and stressed the need for an intra-Afghan dialogue involving Taliban. They however reiterated that they were not yet ready to engage directly with the Government, he said. He welcomed today's adoption by the Council of a resolution which renewed UNAMA's mandate until 17 March 2017 and reaffirmed its important supporting role, at the request of the Afghan Government. 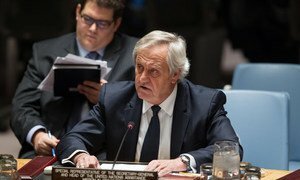 The top United Nations envoy for Afghanistan today said there was renewed hope for the peace process as he briefed the Security Council, which extended the mandate of the UN mission in the country for another year.